It’s summer time and I am smiling because my garden is in full bloom! For the past month we have been enjoying our treasured peaches. They grow big and plump. I like to pick them when they are slightly ripened. They appear firm on the outside although the flesh is pleasingly sweet with just the right amount of tartness. My husband on the other hand enjoys a very ripe peach. Almost to the point of it falling apart in the palm of his hands. We give each other a look every time with thoughts of “you don’t know what you are missing”! You’re probably thinking if they are so good then why grill them? The answer is “yes”, the peaches are amazing on their own and don’t need any enhancements. But, when there is a tree load of them and you are grilling on a beautiful summer’s day, it’s the next best thing! Cooking fruit takes the flavor to a whole new level. The aroma is euphoric and the taste is magnifying. This recipe is a perfect dessert to make just before you turn off your barbeque grills. The sugar and spice mixture has three ingredients, brown sugar for caramelization, cinnamon; a complimenting and comforting spice, and cayenne pepper; an unexpected dash of heat. After the peaches are grilled to a light tenderness, they are coated in honey for a delightful sweetened glaze and finally topped with a tad more sugar and spice. I’m a light kind of gal, especially on a hot day so I served my peaches with whole plain yogurt and chopped walnuts. You can also serve them with frozen yogurt or ice cream. Drizzle the leftover drippings from the grilled peaches dish all over for extra delicious flavor. Use leftovers to add to cottage cheese for breakfast the next morning! Enjoy the peach season while it’s here. It will make you happy! Peaches are delightful but they taste entirely different when cooked on the grill! Serve these caramelized sweet and spiced peaches for your backyard barbeque parties. It’s the perfect summer time dessert! Set barbeque grill to medium-high heat. Mix brown sugar, cinnamon and cayenne pepper in a small bowl. Lightly spray grill with non-stick cooking spray. 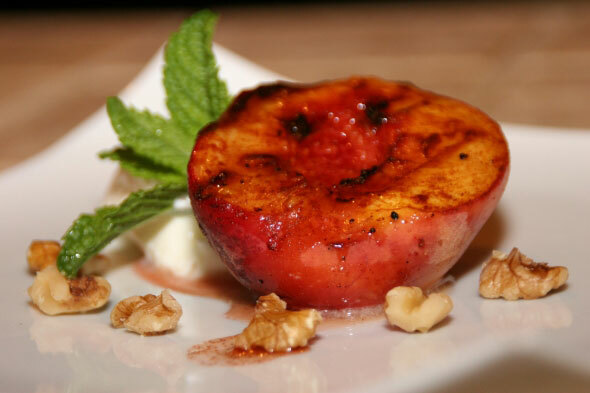 Cook peaches cut side down on the grill until fruit has grill marks and begins to caramelize, about 2-3 minutes. Turn peaches over, lower heat to medium, cover grill and cook until fruit is tender, about 5-7 minutes. Transfer peaches to a platter and generously brush all sides of the peaches with honey. Lightly sprinkle cut side of peaches with reserved sugar and spice mixture. Transfer peach halves to individual serving dishes. Serve with plain yogurt, top with chopped walnuts, drizzle with remaining fruit drippings and garnish with fresh mint.